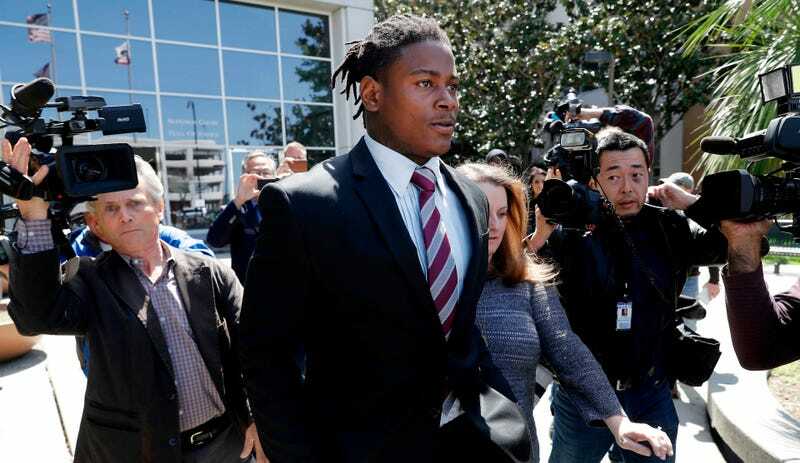 The Sacramento Bee’s Matt Barrows obtained police reports and 911 calls that shed new light on what happened the morning of Feb. 11, when 49ers linebacker Reuben Foster was arrested and charged with felony domestic violence. The Santa Clara County District Attorney’s office said in a release last month that Foster punched his girlfriend Elissa Ennis in the head “8 to 10 times,” ruptured her eardrum, and threw her out of their house by her hair. Through her lawyer, Ennis later recanted her statements and said Foster never hit her, though the DA is still prosecuting Foster on the DV charge, as well as two other felonies for forcefully attempting to prevent a victim from reporting a crime and possession of an assault weapon. Upon arriving at the scene, police took photos of Ennis’ injuries, which included a swollen right lower lip, scratches and a cut on the back of her neck and a scrape on her left knee. She also complained of ringing and poor hearing in her left ear, which subsequently was diagnosed as a ruptured ear drum. However, she says those were the result of a fight stemming from a “road-rage incident” within two days of Feb. 11, and video of said fight has been turned over to the DA’s office, who have positively identified Ennis as one of the participants. Authorities are still prosecuting Foster on all three charges, and a hearing was held in the case this morning. Prosecutor: Niners Linebacker Reuben Foster Ruptured Girlfriend&apos;s Eardrum, Hit Her "8 To 10 Times"